How babies learn to walk with push and pull toys? There are baby learning toys that can help babies acquire one key skill: learning to walk. Pull and push toys help babies learn to walk and develop a sense of coordination and balance. They can also help strengthen their leg and arm muscles. Pushing one of these toys teaches babies how to walk. On the other hand, pulling the toy, enables them to gain balance. Push and pull toys also encourage babies to learn how to step forward and backward. Babies and toddlers usually have a favorite pull and push toy and you will notice that that they are fond of repeating everything they do when at play! There is a whole range of push and pull toys in the market: from full-size walkers to simple push toys on a stick. Make sure that the toy that you get is age appropriate and safe for your child. 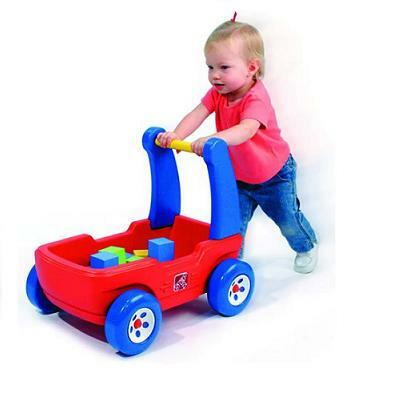 We recommend toys with a handle that your child can push and hop into like cars, wagons or baby doll carriages. We like the Walker Wagon (designed for ages 18 months and up). This toy assists toddlers in learning to walk and can also be used for hauling toys. It includes 16 soft foam blocks, great for toddlers. We also recommend the Jolly or Fire Engine Walker Push Toy mostly because it is beautifully crafted in environmentally friendly rubberwood and bright colors and because it contains a storage compartment. Very cute and stury, it is also fairly heavy unlike other push and pull toys, so that your baby does not tip over. You can also adjust the tension of the backwheel, another very practical feature of this toy.